There are two separate decisions you will need to make during your application process. Where should you apply? Where do you want to go? You will struggle to differentiate between these two questions at some point. Just trying to get into “somewhere” and confirmation bias could influence you. Use this simple rule to separate these two questions: where you want to go is agnostic of your chances of getting in, where you should apply is not. If you are not sure you want to go to business school, are willing to wait a year if you do not get into your top choice(s), or are unwilling to go to a runner-up choice, your list of schools can be the same for both questions (“Flexible Applicant”). If you are sure you want to business school next year, you definitely need to consider your chances of getting in when deciding where to apply (“Committed Applicant”). Where do you want to go? There are basically 2 schools of thought: First, go to the best school you can get into. Second, go to the school that is the best “fit”. Determining “fit” is tough, the best schools are a little easier. Take rankings with a grain of salt; remember that if magazines published the exact same list every year, no one would care. They are incentivized to change their rankings every year and publish ridiculous things, like “HBS is #8” (that’s stupid) and “What is wrong with Wharton?” (absolutely nothing). As far as rankings go, I believe the simpler the better. I am partial to Forbes, which calculates a simple ROI and shares their criteria. Viewing composite rankings (BusinessWeek and US News) only shows you what others think is important, not what you think is important. The second school of thought is about finding “fit”. For this I recommend making a “Fit List” of what is important to you and ranking schools on each item on your list. The best way to experience fit is to do an official school visit (this also has the added benefit of making your application easier). For me, I chose 4 categories (each with several criteria): Lifestyle and Environment, Perception and Salary, Teaching and Curriculum, and Innovation Atmosphere. I then took the added step weight each category and criteria based on its relative importance to me. This was minimally helpful. Essentially, the only value gained from this step was ranking each criterion by importance (not the actual quantitative result, which seemed too arbitrary to be useful). Where you should apply? For Flexible Applicants, I recommend narrowing your list to 2-3 schools. This should be the best schools for what you want to do or the top schools on your Fit List. For Committed Applicants (definitely going to B school next year), you should be thinking 4-6 schools. This should be your top 2-3 schools, plus 2-3 “Bumper Schools”. These schools will help ensure you knock down at least one pin. They are still high on your list, but where you will be a very competitive applicant. You should also get at least one application done during Round 1 to ensure that there is time to finish or adjust strategy in Round 2. To find your Bumper Schools, consider creating a two-part metric that utilizes both your personal ranking and difficulty to get into, such as selectivity %. Schools in the South and Midwest such as UNC, Ross, Duke, and Booth, have high selectivity % relative to their perception and brand. Schools in California and the Northeast, such as Berkeley, MIT, and Yale, have low selectivity % relative to their brand. 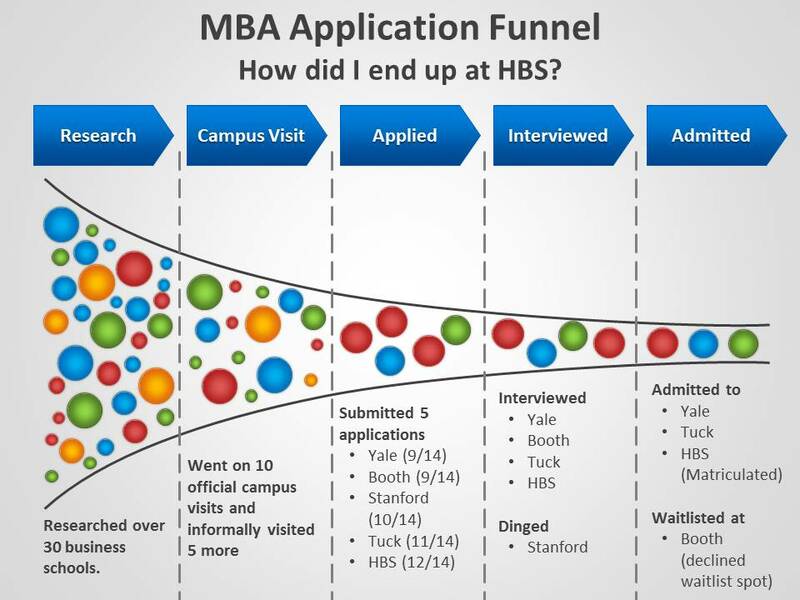 Ultimately, think of the application process as a “funnel”, where schools attrit at each step. I hoped to get into two schools and allow the admit weekend to be the final deciding factor. For this reason, I chose to submit 5 applications and ended up accepted at three (1 more than I had hoped). So when you are applying to business school, remember “where you want to go” and “where you should apply” are not the same thing. 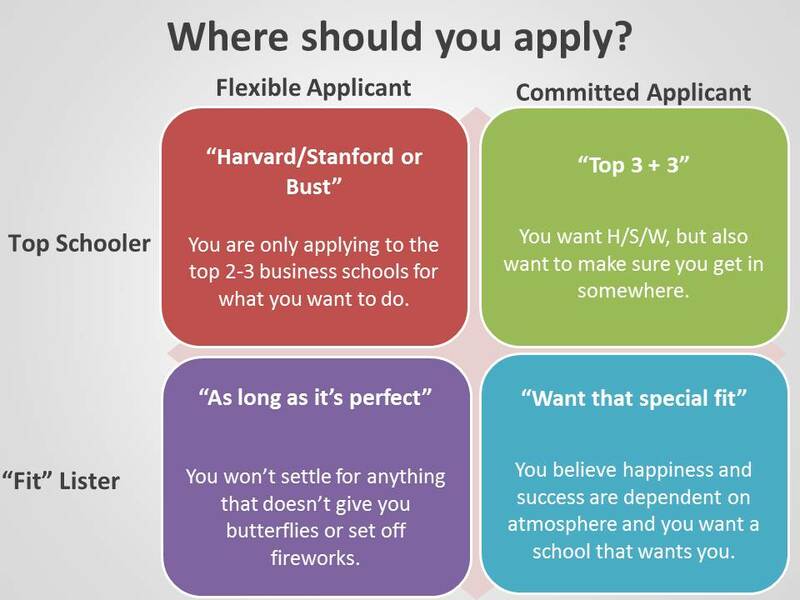 Where you should apply depends on two criteria: Are you a “Fit Lister” or a “Top Schooler”? And are you flexible in your application process?